In 2006, we began to explore ways to collect ice seal harvest information to document the subsistence harvest of ice seals in Alaska. 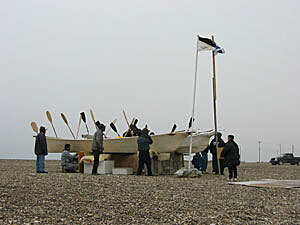 Ice Seals are extremely important to Alaska Natives living along the coast. There are over 60 communities that rely on ice seals for food, clothing, culture, and materials such as skins for umiaq or kayak coverings. Ice seals are also important components of the Bering, Chukchi, and Beaufort Sea ecosystems as both predators and prey. 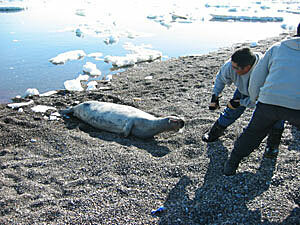 To document subsistence needs, the number of seals used by a community should be collected and recorded annually. Reporting subsistence seal harvest information by community shows how important seals are and how many are needed. This information will become important if climate change or other factors reduce the number of seals in a population or change a species’ current distribution. Reliable seal population estimates do not exist because there are no good ways to count them. Aerial surveys are the best tool but they are expensive and dangerous and although some seals are counted, the number in the water and not counted is unknown. Learning more about the subsistence harvest of ice seals could provide valuable information about the status of seal populations where little information is available. We are working with the Ice Seal Committee (ISC), the Native co-management organization, and regional Native organizations to develop a program to collect harvest information. Identify existing harvest monitoring programs. Determine the preferred method of harvest monitoring for each region. Develop a program to effectively monitor subsistence ice seal harvest throughout Alaska on an annual basis. Develop a means to compile and report the findings in an annual harvest monitoring report. We are working with the ISC, Bristol Bay Native Association, Association of Village Council Presidents, and Maniilaq to collect ice seal harvest information in interested communities. We are working with the ISC to summarize existing ice seal harvest numbers statewide into an annual “Ice Seal Harvest Monitoring Report.” This will provide the necessary means to report the information in a usable, comprehensive format. The current report is available on the ISC website. For more information about this project contact Mark Nelson at mark.nelson@alaska.gov.